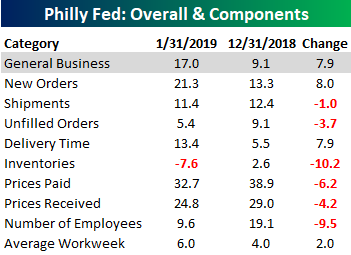 After two straight months of weaker than expected readings and three straight months of declines, the Philadelphia Fed Manufacturing Survey for January came in stronger than expected and increased on a month/month basis. While economists were collectively expecting the headline report to come in at 9.5, the actual reading was 17.0. While the headline index is well off its highs from early/mid-2017, it has now been above zero for 32 months, which is tied for the second longest streak on record. One thing to note about the prior streaks of above zero readings is that in the four prior periods where the Philly Fed dropped below zero after at least 24 straight months of positive readings, it was not a warning of an imminent recession. In fact, the soonest a recession arrived after one of these streaks ended was 15 months. So while the Philly Fed continues to indicate a slowdown in the pace of economic growth, it is not flashing warnings of an imminent recession. Looking at the internals of this month’s report, more components showed m/m declines than gains. Of the nine categories listed below, just three were up m/m (New Orders, Delivery Time, and Average Workweek), while the remaining six were down. On the upside, the biggest gainer this month was New Orders which rebounded by eight points after hitting its lowest level since September 2016 last month. While the drop in Shipments was clearly not the sharpest of the six components that declined, it was notable in that it took that reading down to its lowest level since September 2016.